Le Hoang is known in Vietnam for war films such as Luoi Dao (The Knife), Chiec Khoa Vang (The Golden Key) and Ai Xuoi Van Ly (Going Along Vietnam). In 2003, he had a big success with "Gai Nhay" (Bar Girls), about drug-injecting prostitutes. See Below. Lam Le’s first feature film "Poussière d'empire" was the first international film allowed to be shot on location in Vietnam after the end of the Vietnam War. Lam Le was born in 1948 in Haiphong, Vietnam. A member of jury at La Femis (Paris), his works include: 1) Công Binh, la longue nuit indochinoise (Documentary, 2013); 2) 20 nuits et un jour de pluie (as Lam Lê, 2006); 3) Lola et quelques autres (TV Series) (episodes 3 to 6, 1991); 4) Poussière d'empire (1983) and Rencontre des nuages et du dragon (a short, 1981). French-Vietnamese Tran Anh Hung is Vietnam’s most acclaimed contemporary film maker. He won the best first feature award at the Cannes International Film Festival in 1993 for "The Scent of Green Papaya'' and later won the best film award at the Venice International Film Festival in 1995 for his second feature "Cyclo''. The son of tailors, Hung moved from Vietnam to Paris with his family in 1975 at the age of 12. Although he knew no French when he arrived he persevered and studied hard and won a place at the Sorbonne, where he studied philosphy. He decided to become a film maker when he saw the film Dust of an Empire by the French-Vietnamese director Lam Le. After that he won a place in the prestigious Ecole Lumiere School for cinematographers. Tran Anh’s big break came in 1990 when he hooked up with the French production company Lazennec Productions which financed some short films and produced The Scent of Green Papaya . He had originally hoped to make the film in Vietnam but inexperience and problems and delays there drove him back to France, where pre-war Saigon was recreated on a French sound stage. Tran Anh Hung's Scent of Green Papaya won the Camera d'or Award for best first film at the Cannes Film Festival in 1993 and was the first Vietnamese film ever to be nominated for an Academy Award. It is a slow, poignant and beautifully-shot film following the story of young peasant girl who works as a servant for rich families. In 1995, Tran Ahn returned to Vietnam at the age of 33 to write and direct a film called Cyclo (The Rickshaw Boy), which won Lion d'Or at the 1995 Venice Film festival. Influenced by Vitorio de Sica's 1948 masterpiece The Bicycle Thief , it is the story of a cyclo driver whose whole world is shattered when his cyclo is stolen and he seeks the help on unscrupulous madam and her son. Cyclo has some violent scenes and authorities in Vietnam didn't like it. Each of Tran Anh Hung's films is very different from the others. Hal Hinson of the Washington Post said he makes "interesting, occasionally powerful, but ultimately uneven films that promise more than they deliver." He planned to adapt the book "Night Dogs'' by Kent Anderson. The book is about a policeman who served as a soldier in Vietnam. But that didn’t happen. The film version of Norwegian Wood by Japanese writer Haruki Murakami was directed by Vietnamese director Anh Hung Tran. For many this was a surprise because Murakami has said before the only director he would let handle his works were Woody Allen and David Lynch. “In the late 1960s, Watanabe (Kenichi Matsuyama, Death Note, Kamui Gaiden ) leaves his hometown for Tokyo in the wake of the suicide of his close friend Kizuki (Kengo Kora). Though his classmates are becoming politically active, Watanabe is directionless. That is, until he is reunited with Kizuki's old girlfriend, Naoko (Rinko Kikuchi, Babel ). “Though the film was said to have been shot entirely in Japan, parts of it appear as if they had actually been shot abroad....The film certainly would have lost some of its charm if the three main actors were perfect looking. Each of them, however, is average, be it through reality or makeup. In fact, it is this ordinariness that helps to create the film's depth and sense of reality.” Tran said it would have been inconceivable to film the movie outside of Japan with non-Japanese actors: "What I liked the most about the novel was Japan's culture and the presence of the characters." “While this film is portrayed as a sad story of youth finding their way in life, it is actually a film about suicide and how people are affected by it. John Lennon's titular song accordingly was stuck in my head for days after seeing it. But the more I reflected on the story and its tale of a man with little direction in life, another, perhaps better-fitting Beatles song came to mind” Nowhere Man. Tran Anh Hung's film Ala Verticale d l'Ete ("Vertical Ray of the Sun," 2000) was also highly praised. It is languid film about a dreamy affair in modern Hanoi. It was less controversial than Cyclo and was shown in Vietnam. "The Vertical Ray of the Sun'' stars Tran's wife Tran Nu Yen Khe and was shot in present-day Hanoi. The story hinges on infidelity, passion and staying true to family. "This is a film that is fraught with problems,'' Tran said. "There are problems of couples' infidelity and desire. And at the same time I wanted the public to appreciate this kind of culture where there is a kind of harmony that floats through the whole thing,'' he added. Tran said that after the chaos of making "Cyclo'' in Saigon, he came up with the idea of making a film in the calm of Hanoi and he felt he owed that city a film. Tony Bui’s Three Seasons (1999) was the first American film to be shot in Vietnam after the Vietnam War. Directed by Tony Bui, a Vietnamese who has lived in California since he arrived there from Vietnam wen he was two, it was shot in Vietnam with a budget of $2 million. With the exception of Harvey Kietel, who helped produce the film and get it off the ground, all the actors were Vietnamese or Vietnamese-American. It is about a cyclo driver who befriends a prostitute; a monk who casts a spell on a lotus picker; and two street children who keep each other going. It won the two top awatds at the Sundance Film Festival but some critics didn’t like it. See Tony Bui and The Green Dragon. Nguyen currently hosts "Pacific Time," KQED public radio's national program focusing on Asia and its connections to the United States. He is author of "Where the Ashes Are, The Odyssey of a Vietnamese Family," (Addison-Wesley, 1994), co-editor of "Vietnam, A Traveler's Literary Companion" (Whereabouts Press, 1995), and "Once Upon A Dream, The Vietnamese-American Experience" (Andrews and McMell, 1995). Tsui is not always easy to get along with. He fired the great autuers: King Hu and Yim Ho from his projects. John Woo walked out in him after Tsui produced and re-edited three of his films, including The Killer . 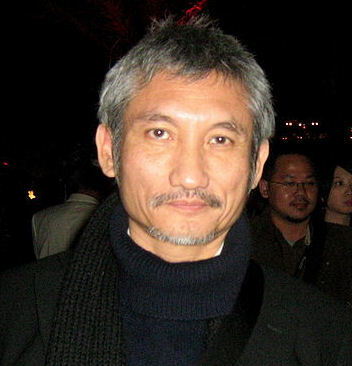 In 1977 Tsui Hark returned to Hong Kong to work in television and make films. Not long afterwards he was producing fast-paced action classics like Zu: Warriors of the Magic Mountain and Once Upon a Time in China, starring Jet Li. In the mid 1990s he made two Jean-Claude Van Damme films. His masterpieces include Peking Opera Blues, Once Upon a Time in China I and II, Swordsman, Butterfly Lovers, Chinese Ghost Story trilogy (with Ching Siu-tung), Green Snake, The Lovers and Time and Tide. In 2006, for the first time, a movie produced by a private production company in Vietnam won a prize at an international film festival. "Ha Dong Silk Dress", a joint product of Phuoc Sang, Vietnamese Film, and Anh Viet production companies, won the audience’s prize at the Pusan International Film Festival (The Republic of Korea). The Vietnam news Agency reported: "The Best Actress award went to Mai Hoa, and the Best Subordinate Actress to Hong Anh. Directed by Nguyen Thanh Van, the movie portrays a post-war love triangle and reveals how far-reaching and unexpected the effects of war can be. It tells the story of a husband and wife who are separated by the escalating war, but the conflict's end brings them no peace. Viet Nam also won the best short film prize. This year, the honour went to film "Chi Nam Khung" (Mrs. Nam) by Director Lai Van Sinh, which praises Mrs. Nam Hong, a combat nurse, who spent 13 years finding the remains of fallen combatants -her team-mates. This is the third consecutive time Viet Nam has won the best short film prize at Asia-Pacific Films Festivals. Vietnam entered five feature films, three documentaries and two animations. Nguyen’s successful career as a stuntman has included films like "Spiderman (1 & 2)" and "Jarhead". "My first acting break was a small part in ‘Cradle 2 the Grave’ with Jet Li." He later received international attention as a villain in Thai film "Tom Yum Goong" (released in the United States as "The Protector") with Tony Jaa. After re-settling in Vietnam in 2005, Nguyen released six films, frequently co-starring with singer-actress Ngo Thanh Van and Dustin Nguyen ("21 Jump Street", "Little Fish"). "The Rebel" (2007), starring all three, is available in the United States on DVD. His latest film "Clash" was featured at this year’s Tribeca Film Festival. Text Sources: New York Times, Washington Post, Los Angeles Times, Times of London, Lonely Planet Guides, Library of Congress, Vietnamtourism. com, Vietnam National Administration of Tourism, CIA World Factbook, Compton’s Encyclopedia, The Guardian, National Geographic, Smithsonian magazine, The New Yorker, Time, Newsweek, Reuters, AP, AFP, Wall Street Journal, The Atlantic Monthly, The Economist, Global Viewpoint (Christian Science Monitor), Foreign Policy, Wikipedia, BBC, CNN, Fox News and various websites, books and other publications identified in the text.